1652 Stater Au. Trinovantes. Late Whaddon Chase type. C, 45-40 BC. Obv; Blank through over use of dies. Rev: Prancing horse r, pellet below. VA 1498-1. Earthy deposits. 5.85g. NVF. 1429 Stater Ar. Sikyonia. Sikyon. C, 400-300 BC. Obv; Chimera walking l. Rev; Dove flying l within wreath. BCD Peloponesos 186. Good metal. 12.17g. NVF. 1433 Stater Au. Trinovantes. Late Whaddon chase type. C, 45-40 BC. Obv; Almost blank. Rev; Horse r, winged object above. VA 1498-1. Good metal and detail. 5.96g. VF. 1434 Stater Au. Trinovantes. Whaddon chase type. C, 55-45 BC. Obv; Abstract head of Apollo. Rev; Horse r, winged object above. VA 1476-3. Reverse a little off centre. 5.92g. NVF. 1431 Stater Au. Gallo-Belgic issue. Ambiani. C, 50 BC. Obv; Blank. Rev; Disjointed horse r. VA 52. Central horse. 6.15g. NVF. 1804 Stater Au. Catuvellauni. Tasciovanus. C, 1st century BC/AD. Obv; Crescents in wreath. Rev; Horseman r, helmeted with carnyx. VA 1730-32. Good metal and detail. 5.50g. EF. 1795 Quarter stater Au. Cunobelin. Biga type. C, 10-40 AD. Obv; CAMVL on panel. Rev; Two horses l, wheel and CVNO below. VA 1913. Nice central coin. 1.36g. VF. 1808 Stater Au. Trinovantes. Addedomaros. C, 1st century BC. Obv; Six armed spiral. Rev; Horse r, cornucopiae below. VA 1620. Centrally struck. 5.53g. VF/NVF. 1806 Stater Au. Gallo-Belgic issue. Ambiani. C, 50 BC. Obv; Blank. Rev; Disjointed horse r. VA 52. Large flan. 6.27g. VF. 1803 Stater Ar. Aegina. C, 480-457 BC. Obv; Sea turtle. Rev; Incuse skew pattern. SNG Dewing 1674ff. Good surfaces. 12.28g. G Fine. 1976 Stater Au. Trinovantes. Whaddon Chase type. C, 55-45 BC. Obv; Almost plain. Rev; Horse r, pellet ornament below. VA 1476-5. Worn dies on obverse but good metal and surfaces. 5.97g. Fine/VF. 1975 Stater Au. Trinovantes. Whaddon Chase type. C, 55-45 BC. Obv; Almost plain. Rev; Horse r, pellet ornament below. VA 1476-5. Worn dies on obverse but good metal and surfaces. 5.84g. Fine/VF. 1206 Stater Au. Trinovantes. Late Whaddon Chase type. C, 45-40 BC. Obv; Almost plain. Rev; Horse r, pellet below, coffe bean behind. VA 1498-1. A little off centre but good metal and surfaces. 5.85g. NVF. 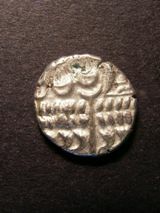 1207 Stater Au. Trinovantes. Late Whaddon Chase type. C, 45-40 BC. Obv; Almost plain. Rev; Horse r, pellet below, coffe bean behind. VA 1498-1. Worn dies but good metal and surfaces. 6.01g. G Fine. 1077 Stater Au. Cunobelin. 'Wild type'. C, 10-20 AD. Obv; Corn ear dividing CA MV. Rev; Horse right, star above, pellet in ring motif below, CVNO in ex (off flan). VA 1933-1. Nice surfaces. 5.40g. VF. 1771 Stater Au. Dobunni. 'Eisu tree type'. C, 15-30 AD. Obv; Dobunnic emblem. Rev; EISV over triple tailed horse, wheel below. VA 1105-1. Super detail, scarce type. 5.61g. EF. 1762 Stater Au. Corieltauvi. 'VEP CORF type'. C,12-15 AD. Obv; Crude wreath design. Rev; Disjointed horse left, VEP above, CORF below. VA 960-1. Large flan on rose gold. Good clear detail. Scarce. 5.31g. NEF. 1768 Stater Au. Cunobelin. 'Wild type'. C, 10-20 AD. Obv; Corn ear dividing CA MV. Rev; Horse right, pellet in ring motif before and above, CVNO below. VA 1933 var. Nice central horse. 5.50g. GVF. 1742 Quarter stater Au. Durotriges. Unlisted 'Cogwheel smiler type'. C,55-35 BC. Obv; Two men in a boat design. Rev: Horse left, sun burst above. Not listed in Van Arsdell -, BMC-, Evans- or Mack-. Pale gold, good strike for issue. 1.01g. VERY RARE. NVF. 1758 Stater Au. Ambiani Gallic 'War type'. C,60-55 BC. Obv; Blank. Rev; Disjointed horse right, crescents and pellets around. VA 54-1. Oval flan with good surfaces and detail. 6.14g. EF. 1773 Stater Au. Gallo-Belgic. 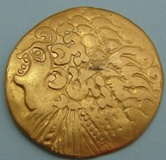 Ambiani C. C, 80-70 BC. Obv; Disintegrated head of Apollo. Rev; Disjointed horse right. VA 44. 6.55g. Scarce. Fine/NVF. 1746 Quarter stater Au. Trinovantes. Tasciovanus. C,25-20 BC. Obv; Wreath design, TASCI in angles. Rev: Horse left, bucranium above, TASC. Van Arsdell 1692-1. Reverse slightly off centre. 1.32g. VF. 1761 Stater Au. Corieltauvi. 'South Ferriby type'. C,45-10 BC. Obv; Abstract head of Apollo. Rev; Disjointed horse left. VA 811 var. Large flan on rose gold with a slight weak patch on reverse. 5.39g. GVF/NVF. 1772 Stater Au. Durotriges. 'Cranborne chase type'. C,58-45 BC. Obv; Abstract head of Apollo. Rev; Disjointed horse left, coffe bean above tail. VA 1205 var. Slight weakness to horses head, good surfaces. 6.26g. GVF. 1744 Quarter stater Au. Imported Morini. C,65-50 BC. Obv; Blank. Rev: Tree like object with bar and crescent either side. Van Arsdell 69-3. Good colour and detail. 1.44g. GVF. 1745 Quarter stater Au. Tincomarus. C,25-20 BC. Obv; TIN on tablet. Rev: Boar running left. Van Arsdell 379. Central panel, good gold. 1.12g. NVF/G Fine. 1743 Quarter stater Au. Iceni. 'Irstead trefoil type'. C,45-40 BC. Obv; Hatched box. Rev: Horse right, annulet below. Van Arsdell 628-1. Rose coloured gold. 1.08g. G Fine. 1020 Au Stater. Trinovantes. Cunobelin. Wild type. C, 20-43 AD. Obv; CA/MV corn ear between. Rev; Horse leaping r, CVN below. VA 1931-7. A little off centre on reverse but good metal and surfaces. GVF. 5.46g. 1552 Au Stater. Westerham type. C, 70 BC. Obv; Devolved head of Apollo. Rev; Disjointed horse left. Spink 21. Centrally struck. 5.87g. 19mm. GVF. 1546 Au Stater. Corieltauvi. Domino type. C 60-50 BC. Obv; Wreath motif. Rev; Disjointed horse left, domino type motif above, star below. BMC 3185. 5.28g. 19mm. GVF. 1547 Au Stater. Corieltauvi. North East Coast. C 60-50 BC. Obv; Wreath motif. Rev; Lunate horse right, pellet below. BMC 182-83. Slight double strike to obverse. 6.27g. 20mm. GVF. 1538 Ar stater. Corinthia. Corinth. C, 345-307 BC. Obv; Pegasos flying left, koppa below. Rev; Helmeted head of Athena left, Artemis behind. Ravel 1076. Good metal and toned. 8.47g. 20mm. GVF. 1619 Au Stater. Ingoldisthorpe type. C, 70 BC. Obv; Devolved head of Apollo. Rev; Disjointed horse right. Spink 20B. Reverse off centre but scarce type. 6.34g. 18mm. VF/NVF. 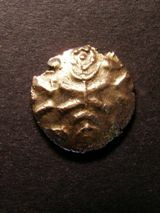 1647 Stater - Ar Stater. Durotrigan E, Abstract (Cranborne Chase) type. C, 65 BC-AD 45. Obv; Devolved head of Apollo right. Rev; Disjointed horse left; pellets above, pellet below, pellet in lozenge above tail. Van Arsdell 1235-1. Reverse off centre but good metal. 5.49g. 19mm. GVF. 1191 Au stater. Insuler Belgic C / Kentish A type. C, 2nd century BC. Obv; Devolved hd of Apollo. Rev; Disjointed horse r, rosette behind, wishbone above. VA -, Spinks 20a. Good sized flan. RARE. GVF. 6.69g. 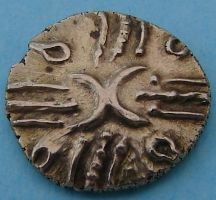 1193 Au stater. Trinovantes. Cunobelin. Wild type. C, 20-43 AD. Obv; CA/MV corn ear between. Rev; Horse leaping r, CVN below. VA 1931-7. A little off centre on reverse but good metal and surfaces. GVF. 5.46g. 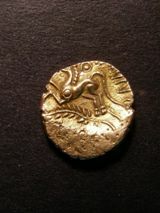 1187 Au stater. Corieltauvi. Domino type. C, 1st century BC. Obv; Crude laureate hd r. Rev; Disjointed horse l, panel containing pellets above. VA 829. Obverse crudely struck as usual. GVF. 5.33g. 104 Stater Early Whaddon Chase. Au Stater. C,55-45 BC. Obv; Wreath motif. Rev; Horse r, ringed pellet below. VA 1476. Super obv detail. EF/NVF. 73 Celtic units (2) a Durotriges Ar Stater, Spinks 366 and an Iceni Ar plated unit. Spinks 445. Both toned. About fine-GF. 596 Greek. Cilicia, Kelenderis(400-350BC) silver stater. Obverse naked rider, with whip in right hand, seated sideways on horse prancing right. Reverse goat kneeling right, looking back. SEAR 5533. Very fine.